CAPE CANAVERAL, Fla. – NASA's shuttle Discovery is fit as a fiddle for its planned launch tomorrow (Feb. 24), setting the stage for the spacecraft's final trip to the International Space Station, space agency officials say. 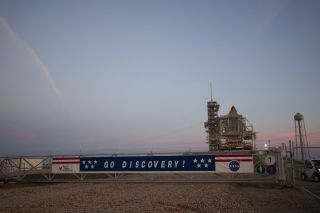 After months of delays, Discovery is once again slated to lift off Thursday at 4:50 p.m. EST (2150 GMT) from a seaside pad here at NASA's Kennedy Space Center. The shuttle's STS-133 mission is the last flight of Discovery before it is retired. "Everything is on track and going beautifully in the countdown," Discovery's mission management team chief Mike Moses told reporters today after shuttle officials cleared the orbiter for launch. "We're more than ready for tomorrow's launch." The shuttle will be hauling critical supplies, including hardware, a storage module and a humanoid robot assistant, called Robonaut 2, to the International Space Station on its final flight. Two spacewalks are also planned, to perform routine station maintenance. Discovery's flight has been delayed since November due to fuel tank concerns and other glitches. Weather forecasts are currently predicting an 80 percent chance of nice, clear conditions for Thursday's launch. "We're ready to fly STS-133," Moses said. "We've been ready from a mission standpoint for quite a while, and now the hardware is in line and ready to go." Scott Higginbotham, Discovery's STS-133 mission payload manager, said that Robonaut 2, which has been packed away in the shuttle's payload bay since Discovery's first attempted launch, is "ready to go to work in space." "We're anxious to finally see our hardware close to flying in space, and put to use on the International Space Station," Higginbotham said. And while the teams who have worked on Discovery are ready to celebrate a successful launch and mission for the veteran orbiter, the air is also tinged with a bit of sadness as the shuttle inches closer to its impending retirement. "Discovery is a great ship – this is the 39th mission," said Mike Leinbach, NASA's shuttle launch director. "It's kind of bittersweet. It's the end of a 30-year program. We've grown to love and appreciate and feel like we're doing something special for the country, and really the world, and that's tough. But we're going to do it right."